Can you help me figure out what’s hype and what’s real among the disruptive technologies? What technologies will support my new business models? How do I pay for all this “stuff” if I want to go forward? The good news – pent up demand signals new interest to spend among business technology leaders. In fact, I’ve spoken with at least a dozen companies investing more into <gasp>… ERP! The bad news – technology is moving so fast that many organizations can’t keep up with what’s new. Most organizations can barely keep the lights on. On my way to Mumbai, the conversations among buyers shared similar themes with one exception – the rise of India in global tech. Now, as many of you know, the trip to India takes almost 24 hours from San Francisco. By the tenth hour, you and your fellow passengers have watched every movie you can see, poorly slept, eaten 2 meals, and more than happy to strike an intellectual conversation. For me, trips to India, Brazil, China, and the UAE always provide good data points on disruptive and emerging technology adoption in fast growing economies. This trip proved no differently. Surrounded by techies, from the IT and bio tech world, we dove into heated discussions ranging from India’s place in the global tech economy; to inspiring innovation in Indian companies; to China vs India; to the future of outsourcing. All in all, these conversations reflected the top of mind items in the tech community and mirrored many of the Nasscom agenda items. Among the NRI’s, a lot of attention discussed the rebalancing of power from the United States to India and China in the tech community. Among us outsiders, we expressed a respect and recognition for how much India has accomplished. 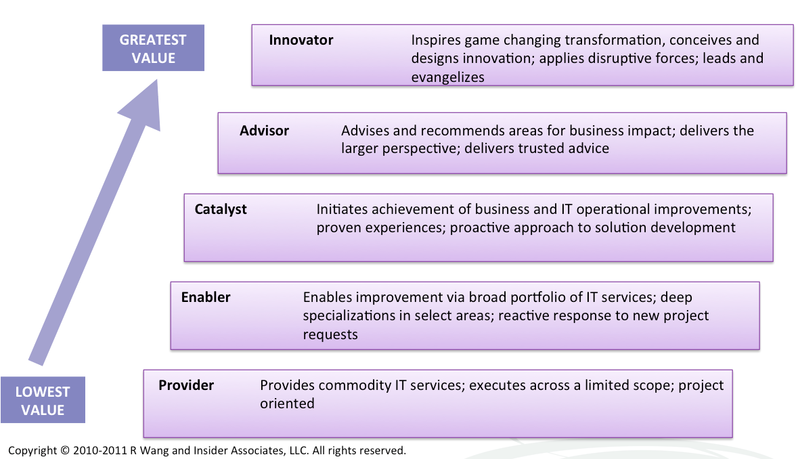 In fact, most infotech firms have made a shift from provider to catalyst (see Figure 1). A few market leaders such as Infosys, HCL, TCS, and Wipro remained within striking distance of achieving advisor status in some industries. Western firms such as Accenture, IBM, and Deloitte seek to move from advisor to innovator status. Hardware companies seek higher margins. Most hardware vendors face single digit margins in their core business. 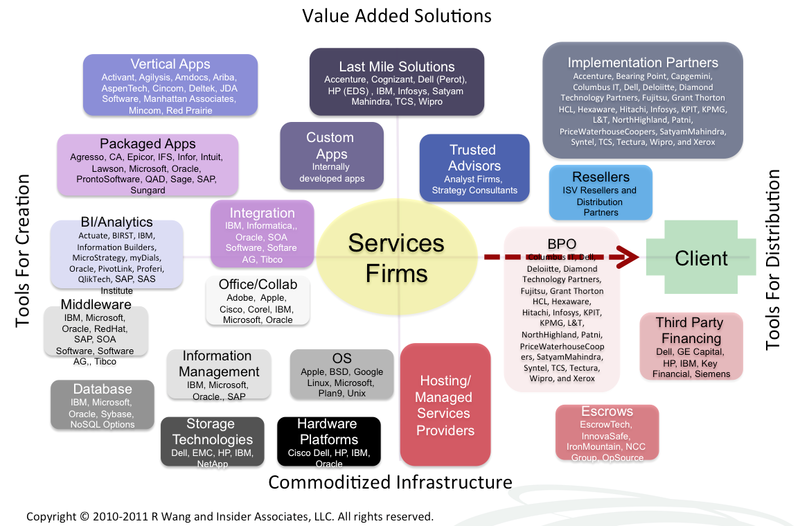 To bolster margins, many vendors acquired system integration firms. For example, HP purchased EDS and Dell acquired Perot Systems. The next logical step requires the hardware vendors to get into software. Software margins hover from 10% to 50% depending on the market. Expect a hardware vendor such as Cisco, Dell, or HP to acquire a SaaS based company to move into the software business. Service providers build differentiated intellectual property (IP) using the Cloud. Service providers should go on the SaaS/Cloud offensive if they want to deliver rapid innovation to customers and break the cycle of dependence on packaged apps vendors. Service providers can take market share through SaaS by investing in white spaces in the solution road map with verticals and other pivot points that have not been well served. In addition, expect forms of SaaS BPO to emerge as clients seek best of breed SaaS and hybrid deployments. Software companies use Cloud to transform into information brokers. SaaS and Cloud deployments provide companies with hidden value and software companies with new revenues streams. Data will become more valuable than the software in the Cloud. Three areas of growth will include benchmarking, trending, and prediction. Companies by-pass software vendors for competitive advantage. Roper Industries acquisition of iTrade Networks on July 26th, proves a key point. Smart and innovative companies will put custom development in the cloud to meet last-mile solution needs that packaged apps vendors or system integrators fail to deliver. Companies may also acquire software vendors if they can’t build the solution. India’s earned its place on the technology global stage. However, Indian infotech companies face serious challenges from tech giant partners such as Cisco, EMC, HP, IBM, Microsoft, Oracle, and SAP. Why? As each seller (vendor) encroaches on adjacent spaces, sellers will break apart existing business models and partnerships in the name of profitability. More importantly, technology vendor consolidation has led to a continued and increased dependency on the fortunes of the western technology vendors by Indian infotech services firms. Today’s western technology firms have the upper hand as IT services firms focus on becoming the “best” partners of the ISV’s, not the other way around. Case in point: The investment IT services firms are making in training and staffing for upgrades, partner solution certifications, and in some cases co-development with western technology firms. This flow of activity is typically one way – at the expense of the Indian IT services firm, requires forfeiture of intellectual property rights, and with no exclusive guarantees of go to market rights for any time periods. 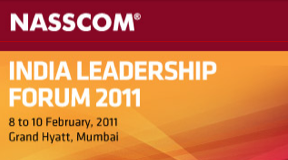 My question to Nasscom attendees: does this have to be the way moving forward? Building thought leadership and thought provoking leadership. Firms must start by showing leadership in areas. Drive thought provoking ideas. Introduce new business models. Earning the role as a strategic advisor. Continue to move up the service firm maturity model in Figure 1. Relationships must be made and established at the executive and board room level. Use local based sales and engagement teams to achieve this. Owning a category micro vertical, geography, market segment, or role. Specialization will drive long-term growth. In addition, building specific IP will also provide a barrier to entry to competitors. The challenge – find the profitable specialties that match domain knowledge or acquire the appropriate pieces. Monetizing Intellectual Property via the Cloud, PaaS, and SaaS. Stop building your IP on someone else’s middleware!!! Use cloud to take a SaaS offensive. SaaS allows any seller with IP to reach all markets with minimum barriers. Leading your own solution centric ecosystem. Determine where your organization should expand into in the ecosystem (see Figure 2.). Find your partners and stop being someone else’s partner! Investing in disruptive business models and emerging technologies. Get acquainted with the emerging and disruptive technologies. Consumer tech innovations now enter the enterprise at a rapid pace. Find the disruptive businesses to match client requirements and invest in new offerings. Delivering third party maintenance. Take part the existing vendor hegemony. By delivering on third party maintenance, you’ll free up revenues that could be invested in your projects, not over-inflated profits. Create a win-win so that clients save and innovate while you grow your business. Do you agree? Got another strategy to add to the list? Please add your comments or privately reply to rwang0 at gmail dot com or r at softwaresinsider dot org and we’ll keep your anonymity. Incorporating new business models such as social business or cloud delivery for your clients.